Chic Event Rentals offers a variety of different draping options to enhance your wedding or event. 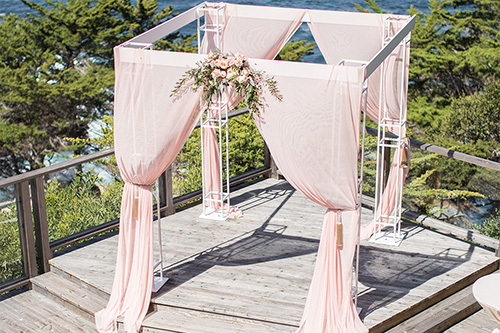 Adding draping is a great way to add a "wow" factor to a bare event space, tent or arbor. Available in many colors in both solid and sheer fabrics, the possibilities with fabric are endless. 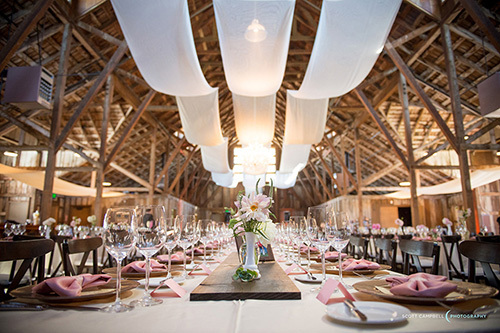 Whether you want to add a more upscale look to a barn or tent, hide something you would prefer your guests not to see, or soften the walls in an event space, draping is the answer. 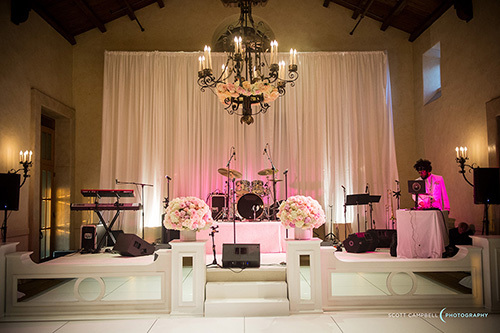 Call us today at (831) 375-1055 to speak with one of our draping specialists to find out how we can enhance your weddings and events using draping! Ceiling draping is overhead draping that can be added to almost any event space and will be sure to create a grand statement for you and your guests. Ceiling draping is often used to help create a cozier and more intimate feel in tents and barns with high ceilings. It is also often added over focal points of events, such as dance floors, to help the area stand out. Pipe & drape is a system that allows you to add floor to ceiling fabric. This is the perfect way to grab guests’ attention by adding a special backdrop behind a sweetheart table or creating a grand entrance to any event space. Other uses for pipe & drape include creating booths at tradeshows, softening the walls of ballroom and hiding things you prefer not to be seen by guests. There are endless uses for fabrics in weddings and events. Some popular ways include adding fabric to your ceremony arch, draping each leg of a tent and flowing from large branches of trees.